uuid : 6d70ad54-64c9-4f5a-b02b-03a81d2f7f47 templates_id: 119514 templates_uuid: "1ddda549-aea1-4128-8509-9e03c8ac25e4" title: "Declaration of trust - Tenants in common agreement - Deed of trust" display_name: "Declaration of trust" meta_keywords: "Deed of trust, Tenants in common agreement or Co-ownership agreement" description: "
If two or more people are purchasing a property together they may want to purchase as tenants in common. This declaration of trust for tenants in common records each person\'s contribution and therefore the proportions of the property they own. A deed of trust can also record contributions to mortgage payments and maintenance. Creating this declaration of trust when purchasing is important when the property is sold as it ensures that each homeowner gets a fair portion of what they put into the property. If additional people, other than the homeowners, have contributed to the purchase price you can look at our Declaration of trust with beneficial interest. A declaration of trust is a document that confirms the proportions in which two or more individuals own a property. It contains an express declaration that the co-owners hold the property on trust for themselves as tenants in common. Unlike joint tenancy, tenants in common can specify their distinct share in the property. This document sets out the respective beneficial interest of each tenant in common based on their contributions to the deposit, mortgage and ongoing maintenance. Do I need to register this declaration of trust? Once the declaration of trust is complete, it should be registered at the Land Registry, but this is not necessary. It is recommended to show evidence of the true ownership of the property. You can do that by completing the declaration of trust panel in Form TR1 (during a house purchase) or Form JO (to be used in the absence of a transfer, asset or lease) and send it to the Land Registry. This declaration of trust is governed by the law of England and Wales.
" created_timestamp: "2018-10-08 04:36:34.0" modified_timestamp: "2018-10-08 04:36:34.0" active: true created_by: 236 modified_by: 236 dcm_id: 298 url_slug: "Declaration-of-trust" meta_description: "Free declaration of trust template. 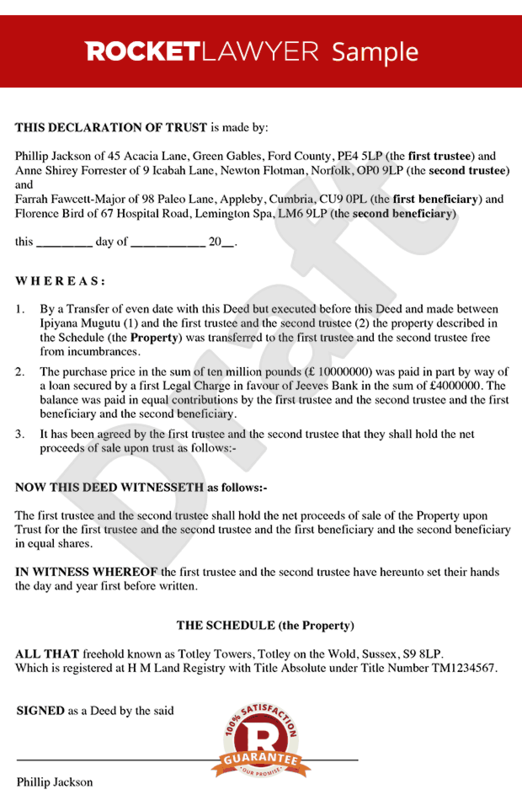 Use this deed of trust when two or more people buy a property together and contribute sums to the purchase price. This deed of trust uk lets you set out specific contributions to the purchase price." time_to_complete: "15 minutes"
If two or more people are purchasing a property together they may want to purchase as tenants in common. This declaration of trust for tenants in common records each person's contribution and therefore the proportions of the property they own. A deed of trust can also record contributions to mortgage payments and maintenance. Creating this declaration of trust when purchasing is important when the property is sold as it ensures that each homeowner gets a fair portion of what they put into the property. If additional people, other than the homeowners, have contributed to the purchase price you can look at our Declaration of trust with beneficial interest. More than just a Declaration of trust template, our step-by-step interview and guidance makes it easy to create your document. Easily create online, download, print and sign your free Declaration of trust in minutes. This document is also sometimes called: Deed of trust, Tenants in common agreement or Co-ownership agreement.